In Kullu, the same day, people celebrated what they call as ‘Sairi-Sajja’, while in Mandi too people celebrated with buying and gifting walnuts to their loved ones, one can notice the road sides full of vendors selling walnuts in big sacks. For people of Kullu it is a time of celebration of onset of sharavan month. A night before, mutton and rice feast is prepared for dinner and the next very day of festival starts with intense cleaning and pooja of ‘Kul’ diety and preparation of halwa, which is then shared amongst the family members. It is a festival of meeting and visiting family and relatives and are greeted with ‘Joob’- a green plant, more like grass. However, in Kullu, Mandi, Kangra and Bilaspur the festival is celebrated amongst friends and family while in Shimla and Solan, it is celebrated in much grand scale as a fair with enthusiasm and spirit of enjoyment. In Arki in Solan, a special event of bull fighting takes place. 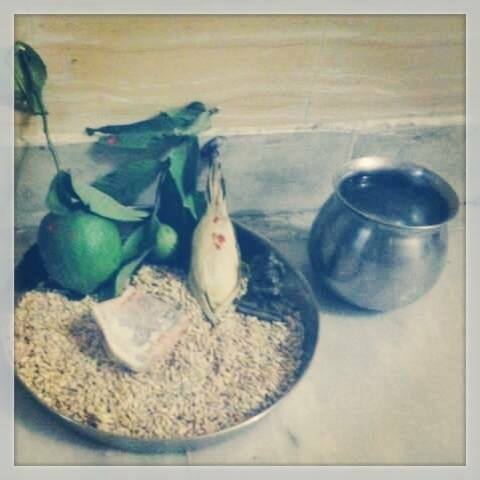 The night before, a plate is prepared for pooja with each of the seasons harvest ie maize, lemon, gauva and some rice and wheat. Some even put cucumber. The wheat is spread on the plate and each fruit is placed on top of it; even more important and necessary is to not forget placing the leaves of each fruit along with it. The next morning, a barber of the village goes to each house before a crow caws, in pin drop silence of the early morning darkness, with the idol of a diety. Now, some say the diety is that of ‘Sair Devi’ while some say there is nothing like a ‘Sair Diety’ and the idol is that of Lord Ganesh! Nevertheless, The barber is then given some of seasons harvest and some money as ‘chadawa’. Some even give their ‘Rakhi’ and ‘Suhaagi’. Later in the morning as many as 6-7 dishes are prepared, of which pakodu, patrodu and bhutoru are a must and rest may vary. 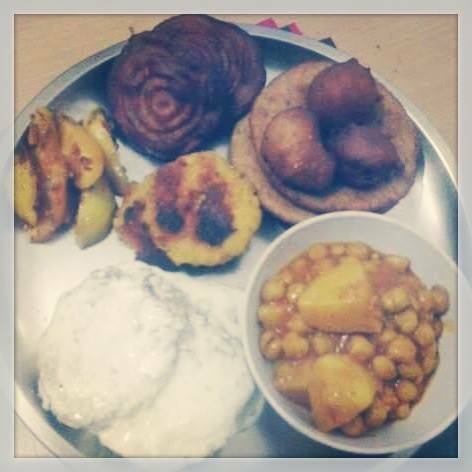 A regular plate with six dishes prepared during Sair festival. Dahi Bhalla, Aloo ki sabji, Meethi roti, Gulgule (fried sweet balls), bhutoru (fried yeasted bread), Kabuli chane and pakodu in centre. Kheer is also prepared in most houses. These dishes are then taken along when visiting relatives and they in return oblige by giving same dishes they have cooked for festival. Next day the lemons are thrown in the rice fields with hope of even better harvest next year. In some regions of Kangra, it is said during this festival a local bird comes which is either dark or light yellow colored. A dark colored bird is a bad sign and convincingly a light yellow colored one means prosperity for the family. The most common belief is that of celebration of reunion or gathering after long heavy rains, an excuse to meet your family and relatives specially women who have been married off. And that of onset of winter season and sharavan month. It is still celebrated with same fervor and spirit in families and villages which have not yet been graced by the blessings of modernization. In modern towns no more a barber visits any house. I wonder, for how long I will keep getting my share of Sair thali, as I savor and gobble down each dish one by one. Posted in Online, Published. Tagged Dharamshala, Food in Hills, Himachal Festivals, Himachali Food, Kangra, Kullu, Sair festival, Shimla, Solan, Thali.